Today Fretter 1.3 has been released. Most important part of the update is the added possibility to strum the zoomed diagram to hear how it sounds. It really eases the finding of the right chord variation. – Added MIDI sound effect: Now you can hear every chordfingering getting played by swiping your finger over the diagram! – MIDI sound effect: backwards swipe implemented: now you can “strum up and down”. – Updated tuning-presets to the correct octave-heigts. (used for midi-playback). – Volume phone buttons in ZoomDisplay control midi-playback volume. – Optimized: ChordFinder speed improvements. 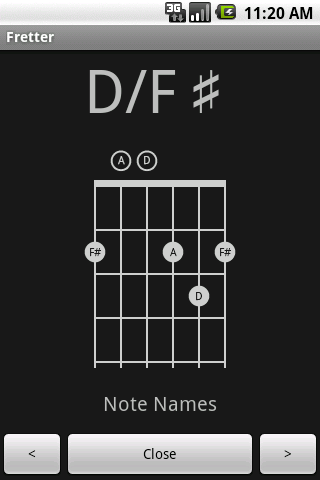 – Optimized: Improved filtering algorithm to filter out non-playable chords. – Added: MENU/SETTINGS. 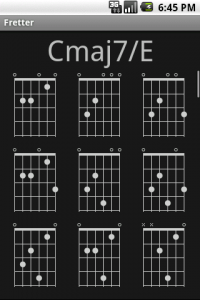 Here you can finetune the chordfinder algorithm. – Implemented the RadioButtons for the Tuning Selector dropdown by creating a CheckedRelativeLayout. – Swapped font-weights on instrument and tuning display on main screen. 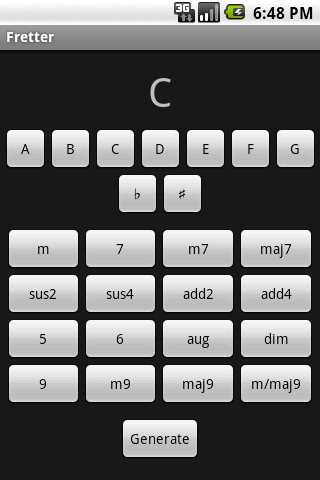 – Optimized layout of Main and ChordSelector screen to have button layout match. – When screenorientation gets horizontal due to using physical keyboard, back button gives sometimes strange results. Fretter is a advanced chordfinder for string-instruments. 7-day trial version is available. I saw this on AppBrain, but don’t know how to pay for it to get it to my phone. Can you help me? Err, do know of any programs that do this on PC?